Apprenticeship can yield a life-long rewarding CAREER !! Apprentices in the construction training program move from first period to eighth period apprentice before becoming a journeyman carpenter. Students learn through an innovative program that combines classroom instruction with hands-on training. Apprentices earn "skill blocks" as they increase their knowledge of basic construction techniques. This training supplements the training and experience they get while working on-the-job with journeyman carpenters. Apprenticeship coordinators manage the programs below and monitor the progress of the individuals who enter the various trade disciplines. Knowledge and training is what puts a skilled carpenter above other workers. For current information on Apprenticeship openings go to either the Bureau Of Labor & Industries for a complete list. For further information on becoming a Carpenter see our Openings page. Registered with the Oregon State Apprenticeship & Training Council. Recognized by the Oregon State Bureau of Labor & Industries. Geographical Area Covered: All of State of Oregon. Clark, Cowlitz, Klickitat, Skamania and Wahkiakum counties and that portion of Pacific County south of a straight line made by extending the north boundry of Wahkiakum County west to Willapa Bay to the Pacific Ocean and, thence, north through the natural waterway to the Pacific Ocean to include the entire peninsula west of Willapa Bay in the State of Washington under the terms of the reciprocal agreement. Minimum Qualifications for applicants are: Seventeen years of age and have a high school, GED, or equivalent OR eighteen years of age. Millwright applicants must be 18 years of age, high school graduate or GED Equivalent, Documentation required. Oregon – SW Washington Carpenters Joint Apprenticeship & Training Committee wants you to know: We believe in Equal Employment Opportunity – The recruitment, selection, employment and training of apprentices shall be without discrimination. Veterans who have GI Benefits may use them in this program. Under certain circumstances veterans may be granted direct entry to the program. Selection Process will be through “ranked interview” of qualified applicants. All applicants will be mailed the results of the ranking. The work of the interior/exterior specialist includes drywall, acoustical ceilings, metal framing, raised floors and lathing systems. Their specialized skills are brought into play as they assemble complex interior systems using technical data supplied by manufacturers. Interior systems carpenters generally need carpentry tools such as saws and hammers as well as mechanic's tools such as drills, wrenches and screwdrivers. They may also use their welding skills to do some assembly work. If you like to work with machine tools and precision instruments, and have a keen eye for the perfect fit, you might consider being a millwright. Millwrights sometime work to specifications requiring tolerances to a thousandth of an inch. In the old days, before heavy metal machinery, millwrights carved out gears and shafts from wood for mills and small industrial plants. Today millwrights are an elite group of construction workers who work primarily in metal and with machinery and equipment requiring precision. A Pile Driver installs wood,concrete and steel piling to hold up docks, bridges and buildings. Usually Pile Drivers are the first workers to arrive at the construction site. In some cases they work on offshore oil rigs and as commercial divers. 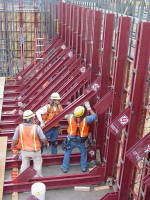 Pile Drivers are also required to install heavy timbers and weld or cut large metal beams. If you like working outside with large equipment, heavy materials, and sometimes under extreme weather conditions, then you will like the hearty occupation of the piledriver! Nationally the Trade Show Industry is one of the fastest growing industries for carpenters. The ability to take any empty facility and turn it into a full show presentation in just a few short days is amazing to see in action. Carpenters move and handle freight, lay carpet, rig equipment, setup pipe and drape, install and dismantle exhibits and modular systems and any other general decorating needs of the exhibitors to make their show a huge success. Carpenters work from coast to coast utilizing their many skills setting up a variety of shows. PNCI has a 50 hour Trade Show training curriculum. These classes are broken down into blocks and are being offered to all members.Many Carpenters will be able to take their training and be able to work part time in the Trade Show Industry. The Apprentice in the Scaffold Erector Apprenticeship Program will develop skills, knowledge, and experience in many areas. Work Processes and Related Training include, but are not limited to, Erection of Frame Scaffolding, Systems Scaffolding, Tube & Clamp Scaffolding, Suspended, and Hanging & Swing Stages. Travel may be expected throughout the States of Oregon, Washington and Montana.